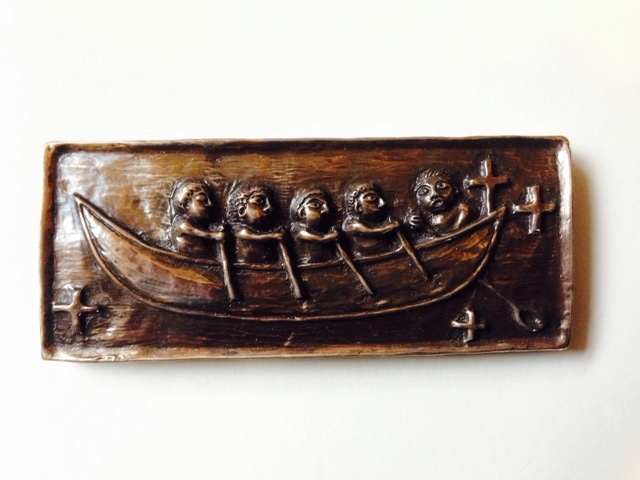 A creationary: a space to be creative with the lectionary. (For more on what is a creationary go here). When I read the narrative of Elijah and widow of Zarephath in 1 Kings 17:8-16 I think of sticks and big jars. Bring sticks. The widow is out collecting sticks when she meets the prophet Elijah, who invites her to practice generosity – to a stranger. And it’s in a time of drought, which is certainly the experience of many churches in the West in general! So the story has a lot to offer in terms of giving – a people in drought are called to be generous with the little they have. So invite people to bring a stick – any type, any sort – simply to create curiousity. And then as a response invite them to bring their sticks as a way of saying yes, I am willing, no matter what the season to practice generosity. Big jars. In the story, the widow only has a little flour and oil. Which makes me wonder what we all already have, even it it seems a little, that we can offer to God. Using a variant of appreciative inquiry, there could be space, in groups, as part of worship, to reflect on what people think their community has already – our gifts – to talk about, write them down, share together. Perhaps even actually have a few big jars. The feedback from the groups could be attached on this. The offerings could be collected in these (allowing reflection on both individual and communal) gifts being given. It could all make for a great communion: the twigs around the communion table, the pots on the table, affirming God’s generosity and provision, despite our sense of lack. There’s also a gospel/culture moment in this story that intrigues me. It’s to do with geographic location. The widow comes from Sidon. So does Jezebel, the champion of Baal, the local god of fertility. So there is a pairing of Jezebel and the widow, both woman, both from the same home town. I like it a lot that Elijah finds life – food and sustenance and gracious hospitality – in the midst of another’s belief system. I’m not sure what to do with that, but given that we live in a pluralistic context of many faiths, that’s worth pondering. Perhaps some phrases in the collect or the benediction: may we find generosity, in the cultures of another. So that’s my first creationary: a creative mind wandering around a lectionary text (1 Kings 17:8-16), the narrative of Elijah and the widow of Zarephath, seeking to make connections in regard to communal worship. For too long the Spirit in Christian thought has been stereotyped, ignored as the forgotten person of the Trinity, left to the Charismatics and Pentecostals. With the church celebrating Pentecost last week, it is surely a season for us all to be reading around the third person of the Trinity. A book like The Holy Spirit: Classic and Contemporary Readings is well worth investing in. 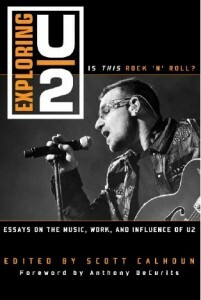 (Make sure you order the paperback edition, because the hardcover price is simply ridiculous). The book gathers readings from across the centuries – 20th century, Syriac, Early Greek, Latin, Orthodox, Mystical. While there are a range of texts of the Spirit, this book does a superb job of gathering a rich range of material from diverse cultures and contexts. A feature of the readings is their genre – while some are theology texts, others are sermons, or songs, or art works, or descriptions of liturgy. As such it reminds us of how much theological work can be done by the church – in our Pentecost sermons, in the songs we sing about the Spirit, in the art we promote, in the words we say at communion and baptism. Each reading has a helpful introduction by the editor, theologian Eugene Rogers. (I’ve noted before here and here his excellent After The Spirit: A Constructive Pneumatology From Resources Outside The Modern West ). Rogers’ introductions are worth the price of the book alone, drawing attention to nuance, layer and complexity. One gripe is the lack of readings from the contemporary Pentecostal or charismatic world. There is now quite enough material to have provided such a section. Is the absence yet another indication that the problem the church has with the Spirit is not just historic, but still contemporary? A creationary is a space to be creative with the lectionary. It is not a sermon. Rather it is what happens when a restless mind reads the Biblical text. 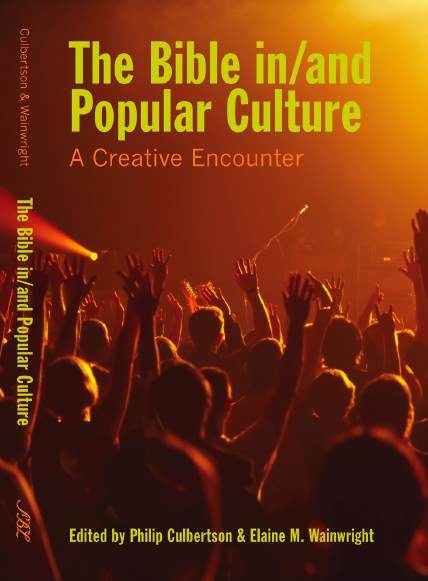 It is the linkages that could be made between the text and various bits of the worship service, questions that could be explored, tactile ways to engage people around the text, songs and videos, poetry, spirituality2go ideas that begin to form. The creationary is a space to be creative with the lectionary. The creationary is a regular feature I want to keep to the foreground both in my life and in the life of this blog-site. There are some personal reasons for this. As a pastor for the last 14 years, I enjoyed (most of the time), the Sunday rhythm of regular engagement with the Biblical text in preparation for worship. The week started with reading the text and there was a creativity about that process. Alas, in the strange ways of God, I’m still in ministry, but no longer (currently) in congregational ministry. So the disciplines have begun to change. Yet in preparing for a recent Ascension service at College chapel, I realised how much I am nourished and find creativity when I engage with the text. I wonder if I can keep in that creative space, even if there is no Sunday outline. 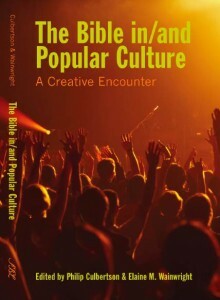 In addition, this blog still gets lots of visits from people looking for creative worship ideas. A 2004 Pentecost worship experience got a lot of hits last week. And there are lots of creative worship treats buried in the archives of this blog, years of ministry, which readers might appreciate. a Trinity tryptch takeaway idea here. All on this blog, all potentially useful. Hence the creationary is a space to be creative with the lectionary. I’m adding a new category, and as a category that runs across the top of the blog. And every Monday I am going to seek to craft some time to read the lectionary texts for the Sunday coming, and to blog some of my thoughts. It might be a list of links as above. It might be some fresh ideas and sparks. If I’ve worked on a certain lectionary text before, I will try and engage with another of the suggested readings for the Sunday coming. I won’t promise to do this every week, but I think it will be pattern that will be good for my ongoing spiritual nourishment. And perhaps in the mercy of God, it might spark more creativity in you my readers. 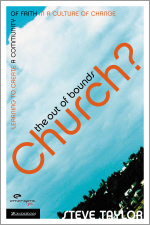 Over the week I had an email, inviting me to speak on the topic of “What is Church?’ to a rural grouping of churches. Over the week, I’ve also been thinking about an invite to speak at CityChurch 2010, the first ever gathering of city centre Uniting church leaders, to explore what it means for them to be church in the context of the centre of the city. Fantastic! Amazing to see such imagination, outside the church, in such a public space. This all links for me with my use of the children’s story book, Bodge plants a seed, including at the recent Queensland Synod (my talk is here). Leaders treating people as seeds, nurturing their growth, seeking the unfolding of their unique charism. I think when he could no longer walk, that he needed to go to the doctor. The Edge here. Having already been financially stung by a U2 postponement, I’m happy to simply being praying Walk on. 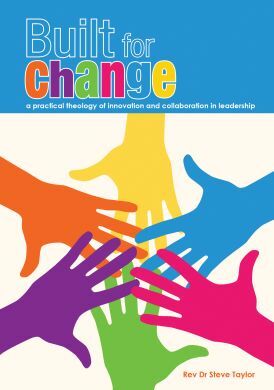 A book review of Paul Aitken and Malcolm Higgs, Developing Change Leaders: The principles and practices of change leadership development . Chapter one here. Chapter two is here. Chapter three is here. The chapter starts by marshalling a wide range of evidence for the importance of values in change leadership. 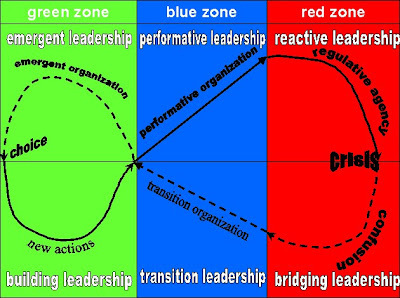 “The management focus for the first part of the twenty-first century will be the management of meaning through the demonstration of values in management behaviour.” (62) The authors urge that selection of change agents include values, as well as experience and competencies. Clan. Family type organisation, (often seen in Japanese companies). Key word is collaboration. Values commitment, communication, development. Leader type = facilitator, mentor, team builder. Hierarchy. Key word is control. Values coordinator, monitor, organizer. Leader type = efficiency, timeliness, consistency. Market. Key word is compete. Values hard-driver, competitor, producer. Leader type = market-share, goal achievement, profitability. Adhocracy. Key word is create. Values innovation, transformation, agility. Leader type = entreprenuer, innovator, visionary. I’d love to write a missional church theology book as a comic book in order to present “a few fat visual metaphors.” But I know I can’t draw. But … I suspect that the discipline of trying would probably make my words a whole lot crisper. 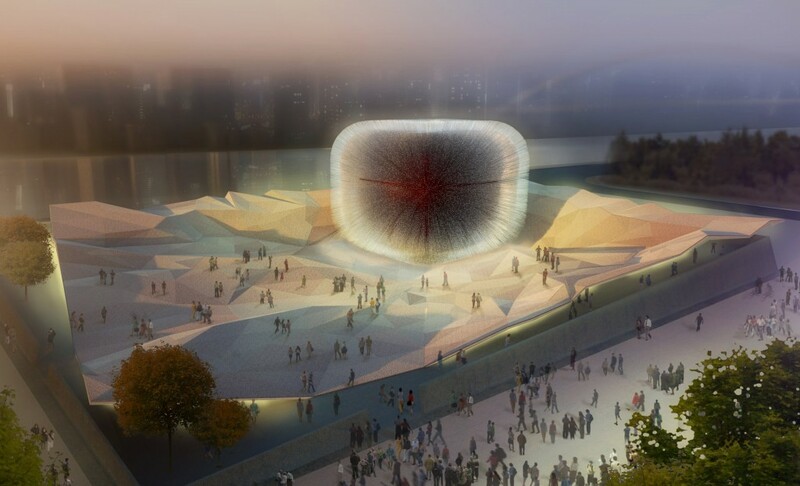 So maybe I could use pictures as part of the concept design? While I’m waffling about books, I’d love to write a book which was not only a comic, but could also be hyperlinked. So that I could be talking about say a missional practice and the reader could choose whether they flipped to the theology, or the Scriptural resources, or the history of how the practice emerged, or the story of how it played out at Opawa, or the change processes that lay behind the idea. Today is a transition day – flying from Maroochydore to Bathurst via Sydney; from Queensland Synod lecture to working for with New South Wales ELM centre (lay ministry training); from one-off talk to two days of rolling conversation around the theme of transformers. 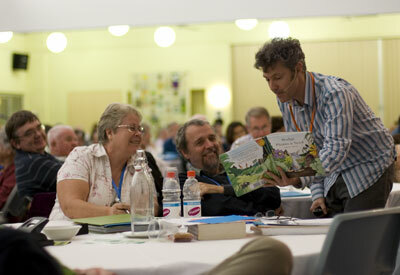 Last night I talked with the Queensland Synod about a word of mission. (Update: summary and even audio are here). It’s a (neglected?) part of Uniting church worship and I used it as a framework to explore my ministry experience with Opawa Baptist. What were the words of mission in our change process? What did we do in actual ministry practice as a result of those words of mission? What were the leadership understandings that helped our journey? the Pentecost story and the word of mission in Acts 2:6 people hearing “in their own language and how that helped shape our multi-congregational model. leadership as process and verb, not position and noun, and the 2009 NCLS resources that let us build leadership teams and invite us into shared processes. At times as I spoke I felt that my attempt to weave the word of mission and the ministry practice and the leadership lessons were too ambitious for an hour lecture on a Saturday evening after a long day. I wished I could have been clearer, but alas, it is too late once one is speaking! And my powerpoints were not good enough. However, there was good group interaction and some thoughtful questions and some fascinating after-ward conversations. May God’s peace rest upon the Queensland synod. Tonight was the opening of the Uniting Church Queensland Synod. It happens every 18 months and Queensland being a big place, people drive for hours, so it’s quite a big deal. The night was fabulous – worship rich in respect for indigenous people and multiple cultures. Visually astute, well choreographed, musically diverse and tasteful. 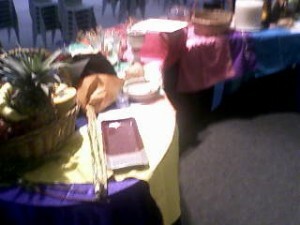 Check out the communion table, shaped as a boomerang, draped in the flags of those who participated. The Psalm that was read was Psalm 126. 1 When the LORD restored the fortunes of we were like men who dreamed. But it was read by a local Aboriginal man. So read it again, imagining hearing the voice of an indigenous Australian. I’ve always heard this Psalm as a Psalm of joy, of praise for Gods’ provision. Tonight it became to feel more and more like a psalm of lament. It seems to me that very few Indigenous people in Australia can claim their fortunes are restored and they have joy in the land. A Psalm of lament? Or a Psalm of intercession? What might it mean for a Uniting church, of predominantly Anglo-Australian’s, to actually hear an Aboriginal man read this Psalm? Might it not call us to ongoing pray and proactive protest, that indeed fortunes will be restored and songs of joy? Australia has great variations in temperature. 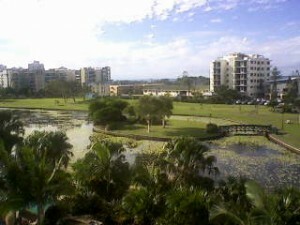 Currently in Maroochydore there is an overnight low of 16 and a forecast high of 24, while in Bathurst there was an overnight low of 3 and a forecast high of 12. This is important because I am packing for both places, first for Maroochydore, to speak to the Queensland synod, and then to Ballarat Bathurst, to speak at the Transformers conference, as part of the New South Wales synod. It will be the 5th time in a month that I have spoken outside the Uniting College lecturing context. To be honest, it is sort of doing my head in. Part of it is simply performance anxiety. When I was at high school, I used to skip school when it came time for the speech contests. I hated public speaking. So there’s a fair degree of anxiety flowing through me today. Part of it is that each is different – in time and audience. Each has a slight variation in theme. Each has different issues they’d like to address and different expectations of how I might engage. The temperature is different in each room. I have a lot of things in what I call my speaking bag, different stories and paradigms and ways I have approached things. Different ways to stimulate people and gain interaction. I find it hard to pull out the same thing and just do it. Yet it has worked once and it would save me the time in trying to know what to pull out, how to start and to connect. Part of it is my creative, restless personality, I like to keep working at things, playing with new ideas. So I simply can’t do the “canned” presentation. I’m not sure why I am writing this, but it’s my blog and writing can clarify …. word of mission: a forgotten Uniting church treasure? The final section – Sending – is divided into a song, a benediction and this thing called “Word of mission.” This “Word of mission”, according to the book, could be a verse of Scripture, a sentence or a brief charge to the people. I’ve never heard this, in all the Uniting services I’ve been part of. I wonder why I’ve not heard it. I wonder if it is just me, or if it’s fallen out of favour in general across the denomination. I wonder if it’s neglect says something about Uniting church life. Here’s an idea … why not every church start a Pentecost journal. This would be read every year at Pentecost. Then, after a time of silence for reflection, updates to the journal would be invited. People would name how the Spirit has been active among them in the year gone. These would be typed up, and added to the journal. Which would be read again next year. This would honour the Spirit as alive today, honour the Spirit as alive in history, appreciate the Spirit as diverse and creative in the life of the community, develop skills of discernment and just be plain interesting.